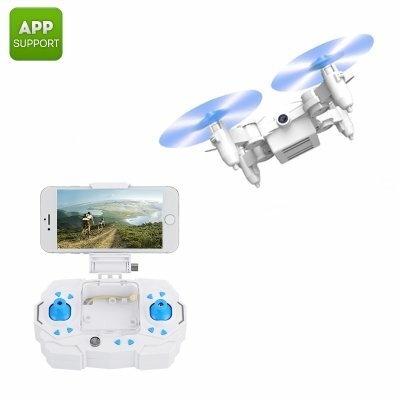 Successfully Added SMAO M1 Mini Drone - Up To 30M Range, Built in HD Camera, 360 Degree 3D Eversion, Six-Axis Gyroscope, Android & iOS Compatible to your Shopping Cart. Are you ready to see the world from an entirely new perspective? With the affordable SMAO M1 mini-drone you will be able to fly away and capture sharp pictures and video’s up to a distance of 30 meters. This magnificent little device is the perfect piece of equipment for everybody who always has dreamt of owning a drone but was set back by their hefty price tags and large sizes. Simply put, the SMAO M1 drone is more than just a simple helicopter toy. This mini drone is an excellent flying device that has been equipped with a 1MP HD camera that captures and records your every unforgettable moment from a complete different perspective than ever before. With the SMAO M1 mini drone you are sure to share all your family’s happiness and precious childhood experiences. But there is more! Not only is this miniature drone the perfect toy to play around with for any child – the SMAO M1 drone along with its HD camera also offers countless of handy benefits for adults alike. Having trouble with your roof or gutter at home but are not confident enough to climb that unstable 10meter ladder yourself? – Are you out for a hike in the wild but are not sure about the conditions of the walking tracks ahead of you? Why not connect your Android or IOS Smartphone to the SMAI M1 mini drone that, along with its HD camera, allows you to have a peek ahead and avoid any unnecessary risks of getting injured yourself! This mini-drone is capable to fly up to 30 meters away from you, giving you a clear and live overview of what lays ahead without risking your own safety. Thanks to its miniature size, light weight, and foldable wings this mini-drone can be easily stored within the remote control – making it an extremely portable device even at times when you are not using it to fly around. Equipped with a set of bright LED lights this mini drone is even ready to take the skies after dark. When flown on full speed the blue and red LED lights create a sci-fi like effect in the sky, sure to grab your child’s attention. Its six-axis gyroscope helps boost the stability of the SMAO M1, making it a fun and easy to handle toy for both adults and children alike. Safe to use and easy-to-operate, the SMAO M1 makes a perfect gift for kids and is always fun and convenient to have around at a family day out, hike in the wild, or even fly indoors. Thanks to its small size this mini drone won’t cause any damage to your home and is available for a very reasonable price. The SMAO M1 Mini Drone brought to you by the leader in electronic devices as well as mini drones..